I was in the back warehouse looking when Malcom Mcassey approached and held out your new book. Wow ! Hand delivered. I took the book home and went through every page. The one thing that stuck for me, as a photographer, is noticing how you weren’t afraid to point the lens at the various characters. In some it looked as though you shot as you approached them, then talked. I really liked the natural feel to those photos rather than if you had said something first they would have instantly started to pose. So,congratulations on your book. You will be amazed as time goes on the responses and interesting comments it will illicit. Jeff Divine, Photo Editor - The Surfer's Journal. 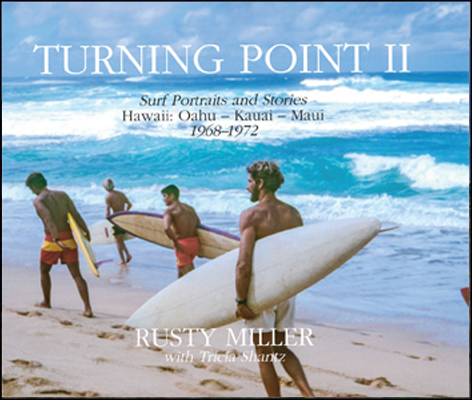 Turning Point is a pastiche of rare, candid portraits taken by Rusty Miller of some of surfing’s most iconic characters caught at a critical crossroads of surfing, 1970 and 1971. The 60s were over, yet the insulated surf culture had not proven immune from the upheavals in the bigger world. The Vietnam debacle had stolen or driven into hiding a generation of surfing’s brightest stars and the split between surfing’s old guard and children of the revolution was never wider. Everything was questioned and the whole culture was up for grabs. Miller’s photos catch the likes of Wayne Lynch, Bob McTavish, Nat Young, Gerry Lopez, and Reno Abellira in that pause before the storm. I am back home having a cup of tea and looking through the book and just marveling at the images and stories, feeling like I am there, or at least being given a front row seat. 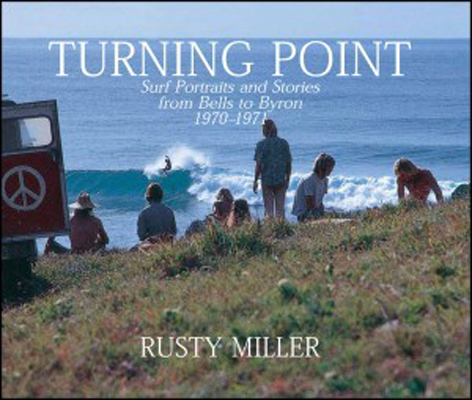 Surfing culture’s sense of community and cool are at the centre of Rusty’s photographs from this turning point in surfing’s time line. Dave Rastovich, Surfer and Environmental Activist.